For those of us leaning to the left within politics, it's with frustration and annoyance that we've to accept that so much can be decided and determined by market forces. View even Ireland's place in the rugby spectrum through such a prism and you get an accurate picture. Look at it this way - the idea of project players and imports may badly damage the entire purpose of the international game, but shunt that heavy load off to the side for a moment and consider the idea of buying and selling different parts. For instance, players not deemed good enough to make it with South Africa and New Zealand are purchased by us and walk onto the team. Meanwhile, a guy like Ian McKinley is half-blind after losing the sight in his left eye and, while below the standard we require, is shipped off to Italy where he makes it. Shouldn't that tell you we are merely somewhere in the middle of the very small field of countries that take the sport in anyway seriously? As it was, is now, and forever shall be. Back in November, to suggest as much was utter heresy. To listen to the choir and their predictable chorus, we were suddenly the best team out there, with the best out-half and coach in the game, a front and back-row to match anyone, and the World Cup couldn't come quickly enough. Alan Quinlan said beating New Zealand was "the pinnacle of Irish sporting achievement", Joe Schmidt was called upon to fix Brexit, Peter O'Mahony was from another galaxy, Bernard Jackman said we were cemented as a top-two team for all of 2019, no matter what came next. Humility has never been a great trait in Irish rugby circles and this was more of the same. Place that lot against the backdrop of Saturday, as less than four months later this team were harassed, bullied, humiliated and embarrassed. Those words aren't too strong either. It was like watching the scrawny kid on the schoolyard having his lunch money ripped from his grasp, before his boxers are pulled up neck high just to reiterate who is in charge. After a week spent farcically arguing over the roof situation in Cardiff, as if conditions bother the really great teams, this was a brutal comedown. The motivation should have been there with this being the chippiest of grudge matches in the competition over recent years, not to mention a title potentially on the line, but all we got was flat and stale. Ireland were dominated in contact zones - the cornerstone of their possession game - leading to slow ball and even less invention than we're used to from a side that rather go through you than around you. This being rugby country, however, there will always be those who continue to engage in the pandering delusion. Miriam O'Callaghan, as an example, called them "heroes" in the aftermath, and for context, can you imagine anyone calling the Irish soccer team after the Danish destruction such a word? This is a problem we've highlighted over and again, for the team exists in the small bubble that is Ireland, and cannot escape the softness with which they are treated and the over-the-top celebrations of wins that don't deserve it. Strangely, it means that losing now isn't all that bad a thing. We've won Grand Slams before, and this year was always going to be about taking steps across uncharted land in the World Cup. Had Ireland actually won the championship at the weekend, can you imagine the hyperbole and hysteria? At least on this occasion the cake was dropped well before the party, and there's time to cook up another one. Besides, as a guide, the Six Nations in a World Cup year is a strange experience. Lost in the shadow of what's coming down the road, there's usually an asterisk. Indeed it's so far out that it means little as you cannot carry intensity that far and that long into October. The guy downing pints for lunch won't be tearing it up on the dancefloor come the night. There've been endless examples of this. In 1995 France came third at the big show having won only two games in that Five Nations, while Grand Slam winners England didn't reach the final. Come 1999 Scotland won the championship and eked by Samoa to a quarter-final where they'd lose, while France who came bottom of the table went to a decider. By 2003, England did buck the trend winning both, but Ireland who played for that Grand Slam on the final day fell when it mattered more to a France side they'd beaten earlier in the year. We all know about 2007 with Eddie O'Sullivan's group winning four out of five at the start of the season and not even making the last eight at the end of it, but formlines didn't hold for others either. Come 2011, Wales were two points from the final and France two points from the trophy having both been beaten twice in the Six Nations. As for last time out, Ireland's northern hemisphere heroics meant little, as Scotland, who came last in the Six Nations, were the closest European side to the semis and the only one of them to retain some dignity. That's not to say there aren't a whole bunch of negatives that came with the result for this wasn't just a regular loss. Mentally, they were a mess, kicking for the corners and presuming they could maul their way over a side that was taking them apart in the tackle. Physically, some parts look spent too. 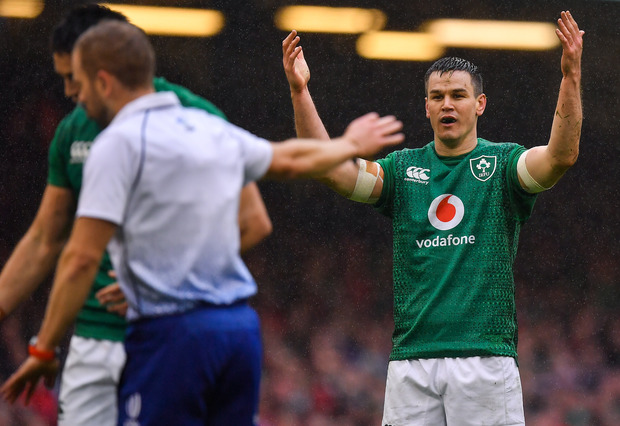 There's been much talk of Johnny Sexton's performance but at least he has shown a smattering of form at different moments in the tournament, even if his temper needs to be curbed and his attitude needs to gain serious maturity. But the same cannot be said for others. Rory Best suddenly looks an old man and Conor Murray has become a liability. On top of that, Seán O'Brien is done. Time waits for no men, not even these. In fact, Best's words afterwards didn't scream pain. It reminded that in so many cases around sporting greats, they never got to enjoy their stint at the very zenith because what drove them on when there was the utter fear of not being the best. When Ireland late last year got a sniff of that, they didn't act like they were scared of the height they could fall from, and since they have plummeted, they've taken it in far too polite manner with shrugs of shoulders and a bizarre blame game. The coach played his part in that in recent days, complaining about the early release of the team-sheet, the extra day the opposition had to prepare, and the old doozy of a bug in the camp. It didn't scream winners. Quite the opposite. So let's see what Schmidt is really made of, for loyalty could be his downfall if some of these faces are thanked for their past contributions by being rewarded in future situations. The gameplan at best needs some tweaking and at worst a complete overhaul as it's been found out by others. A rebuild around personnel and tactics at this point isn't ideal although, while hurried, a break until the provinces are done is a healthy place. Players will have time to digest it and Schmidt himself will have time to take in his contribution, for while he's previously handled himself superbly in victory, now that he's under some pressure he hasn't started so well. Of course, how bad it is can be overstated and has been by some. If we are to argue that the New Zealand win wasn't all it was made out to be because the World Cup is what matters, that applies here also. Instead though, once again many have gone to the widest of flanks in their reactions. It's as if it's always a choice between a three-piece suit complete with monocle or coming down the stairs buck naked. What's wrong with a t-shirt and jeans? After the weekend it's not a case of move on as there's nothing to see here, for there is plenty of wreckage to pour over. But it could have been worse. We could have won, allowing this dismal unraveling to transpire further down the tracks.